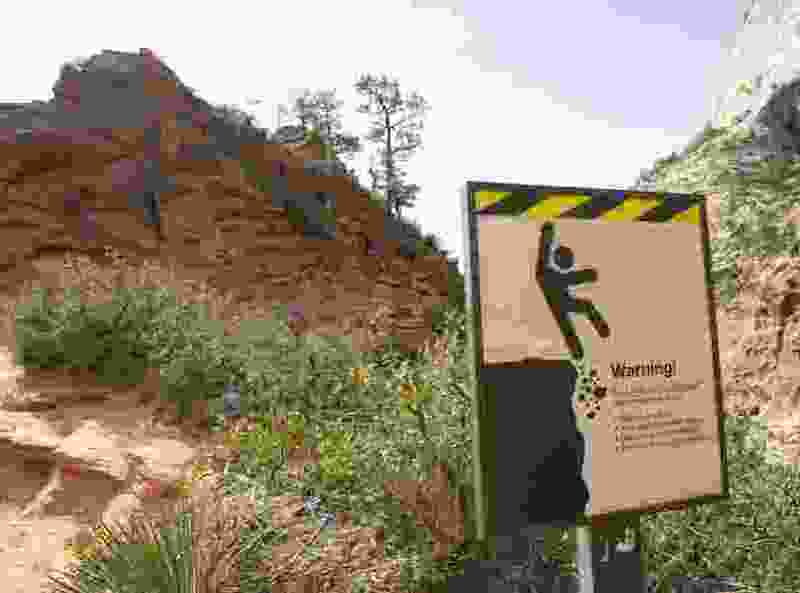 (Al Hartmann | The Salt Lake Tribune) Sign at the bottom of the Angels Landing Trail warns hikers of the dangers of the hike ahead. It might not be business as usual at Utah’s famous national parks during the partial federal government shutdown, but at least some visitor services will be available at three of the Mighty Five through the Christmas holiday, thanks to $80,000 the state has donated to the National Park Service. Utah Office of Tourism Managing Director Vicki Varela arranged for funding to be directed to Zion, Arches and Bryce Canyon national parks during a call with park superintendents Thursday. Details were finalized Friday as Gov. Gary Herbert authorized the grant to fund these parks through the the end of the year, Varela said. Up to 800,000 federal employs were facing likely furloughs as several agencies shut down in the wake of a budget impasse between President Donald Trump and Congress over funding for a wall Trump wants built along the Mexico border. States that provide funds to support national park operations during the shutdown will not be reimbursed, the National Park Service has said. Herbert is committed to ensuring people can access Utah’s parks and do so in a way that is safe and enjoyable, according to Varela. To that end, the state insisted its grant go toward staffing visitor centers and providing janitorial services to maintain the restrooms. Utah’s busiest park, Zion, sees some of its heaviest visitation over the winter holiday season, accommodating about 170,000 visitors last year. To alleviate traffic congestion, the park restarted its shuttle system Saturday and will require visitors to use it until Dec. 31. However, the usual entrance fees will not be charged. New permits for backcountry destinations will not be issued, but commercial guides and outfitters will be able to conduct trips as usual. Thanks to Utah’s contribution, the Zion Canyon Visitor Center, one loop of the Watchman Campground, and adjacent restrooms will remain open through at least Saturday, according to Baltrus. All park programs have been canceled, including scheduled ranger talks and evening programs. As part of the Department of Interior shutdown contingency plans, all national parks and monuments would remain open to visitors while the government stalls, but it wouldn’t provide visitor services, like restrooms, trash collection, and road and facility maintenance. Capitol Reef and Canyonlands national parks, which have low visitor turnout in the winter, will remain open under those conditions. The park services’ social media accounts and websites will not be monitored or regularly updated and may not reflect current conditions at any of the 400 national parks, monuments and other sites overseen by the park service. Dinosaur National Monument also will remain open, but Quarry Exhibit Hall and Quarry Visitor Center are closed. No services will be provided at the campgrounds, but visitors will not be asked to leave unless safety concerns arise, the monument announced. The Utah Office of Tourism is providing updated park information and ramping up customer service on its website, visitutah.com. Lands administered by the U.S. Forest Service and Bureau of Land Management will remain open to the public. National parks are a key piece of Utah’s outdoor recreation and tourism industries, which generate $12 billion and $9 billion in economic activity respectively. The state gave more than $1 million to get the parks reopened early during the 2013 shutdown, but economists still estimated that the park closures cost the Utah economy $30 million. During a brief government shutdown last January, poachers killed a pregnant cow elk in Zion, triggering criticism that leaving the parks open without adequate staffing harms park resources. During the January shutdown, the park service staffing was reduced from 20,000 to just 3,298 “essential staff," which led to myriad problems, like trash pileups, unsafe or illegal behavior," according to NPCA. “At Zion, they had problems with toilet paper blooms, which is disgusting,” said David Nimkin, the group’s southwest regional director. Winter is a time when park trails are often treacherous, especially at Zion and Bryce Canyon, because many are carved into the sides of cliffs and can be covered in ice and snow. Park officials could close dangerous trails, but unprepared visitors could just walk around the signs and get themselves in trouble, Nimkin noted. “This is not a full park experience,” Varela said. “We are just bridging the gap to provide visitor services. People need to use good judgment to make sure they get guidance and advice for a safe visit. That’s why we thought it was important to have visitor centers open. People need to come prepared and wear good shoes because rangers will not be throughout the park." Tribune reporter Paighten Harkins contributed to this article.